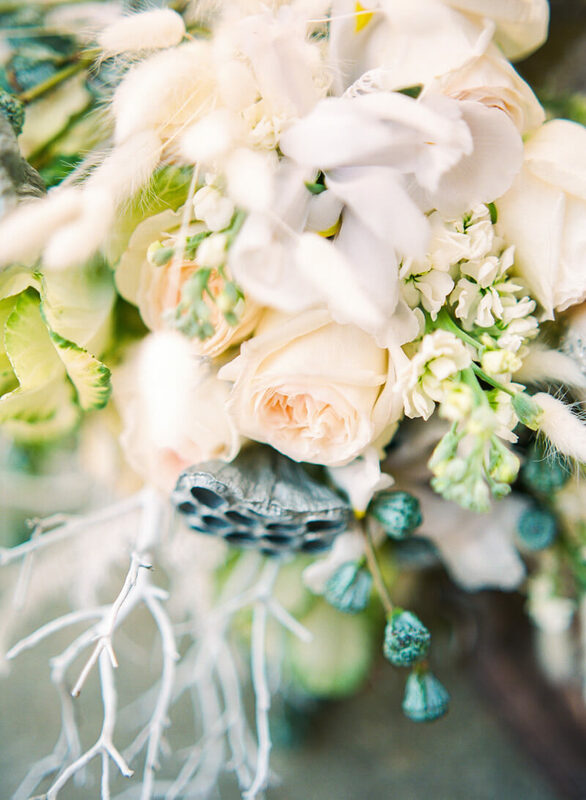 Atlanta Wedding Inspiration - Cator Woolford Gardens. 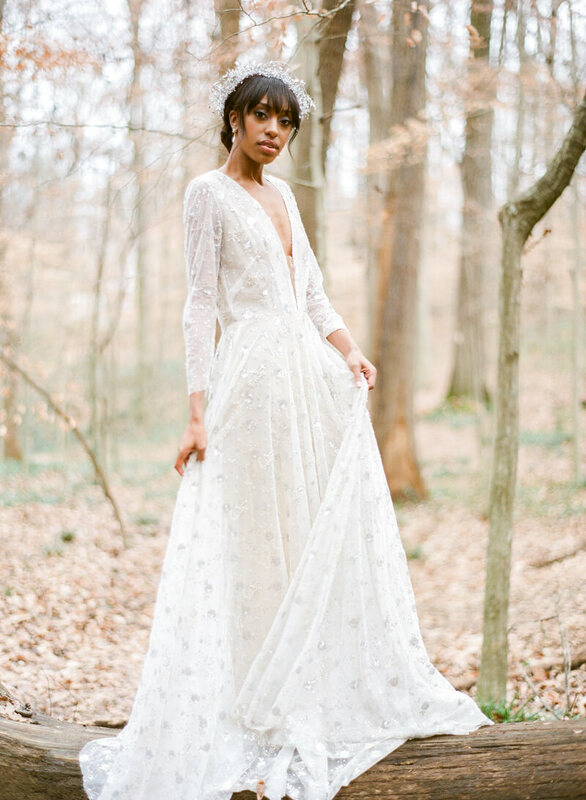 Set in the enchanting Cator Woolford Gardens in Atlanta, Ga., this styled inspiration is a celestial-inspired dream. 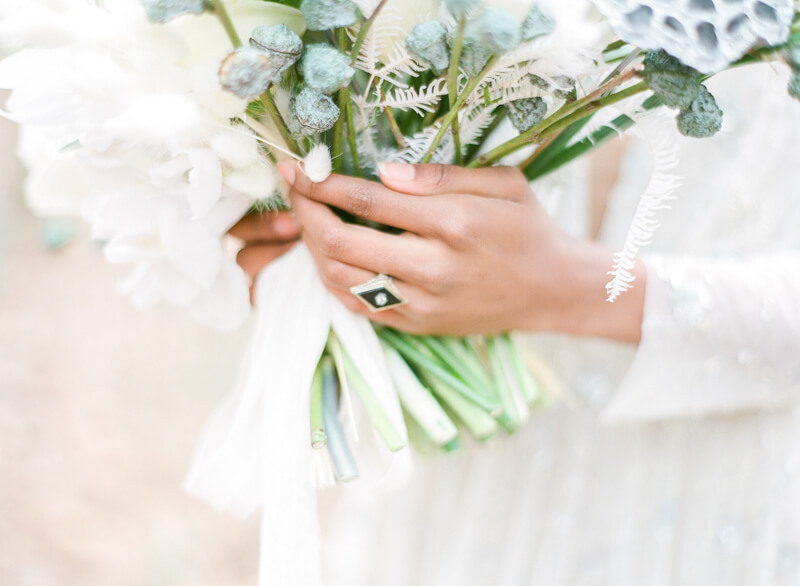 With a starry-eyed bride in a dreamy beaded gown and florals that are out of this world, this shoot proves that when it comes to wedding design, the sky’s the limit. The night sky inspired this styled shoot in so many ways. The invitation suite boats a classic style with simple white parchment and elegant script. The florist went above and beyond to create a bouquet that combines elegant wedding design with celestial-inspired style. White branches, fluffy white “bunny tails,” roses and lotus pods unite in this captivating arrangement. 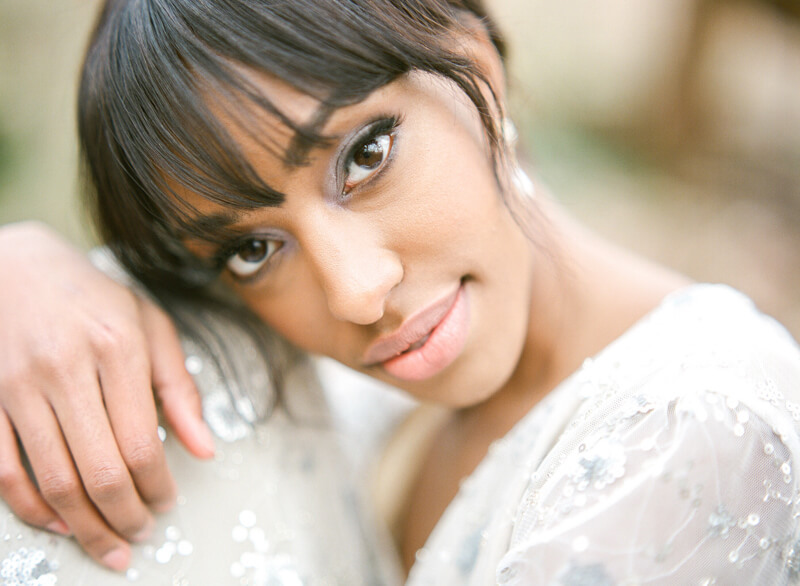 The bride’s accessories include lightly beaded heels, gilded star earrings and hairpins. In lieu of a veil, she dons a sparkling silver crown. Her gown is a modern vision. It features a deep V-neck, long sleeves and a flowing silhouette. The entire garment is sprinkled with delicate beading that resembles stardust. The ring is an onyx family heirloom that perfectly captures the look of a star in the night sky. The makeup artist uses a creative technique to include the theme in the bride’s look. While her overall appearance is natural and light, the makeup artist incorporates bright silver tones around the eyes to add a bit of luster. Her A-line dress also features a gorgeous and unexpected keyhole back. 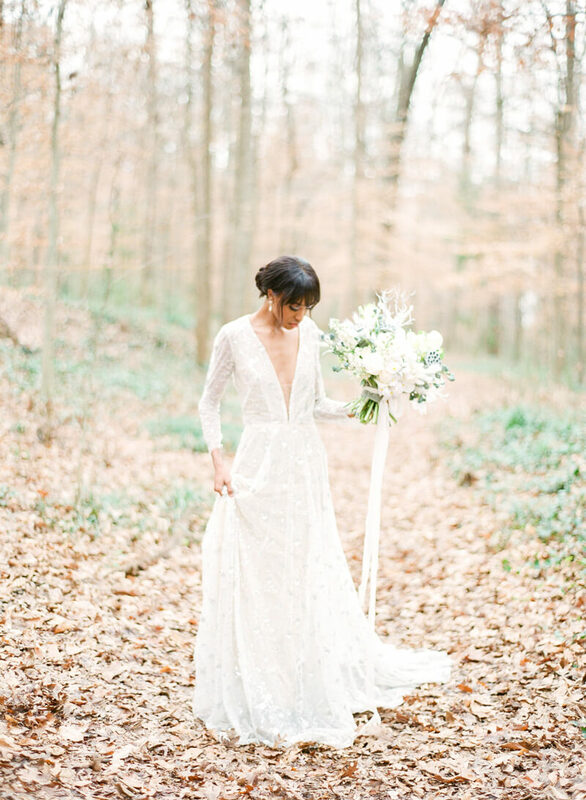 All elements combined, the bride is an emerging goddess deep in the heart of the woods. The bright white chair, along with her brilliant gown, has her beaming amid the trees and gardens. Delicate accents like a vintage drinking glass and small roses are just the finishing touches to tie in a timeless wedding appeal. 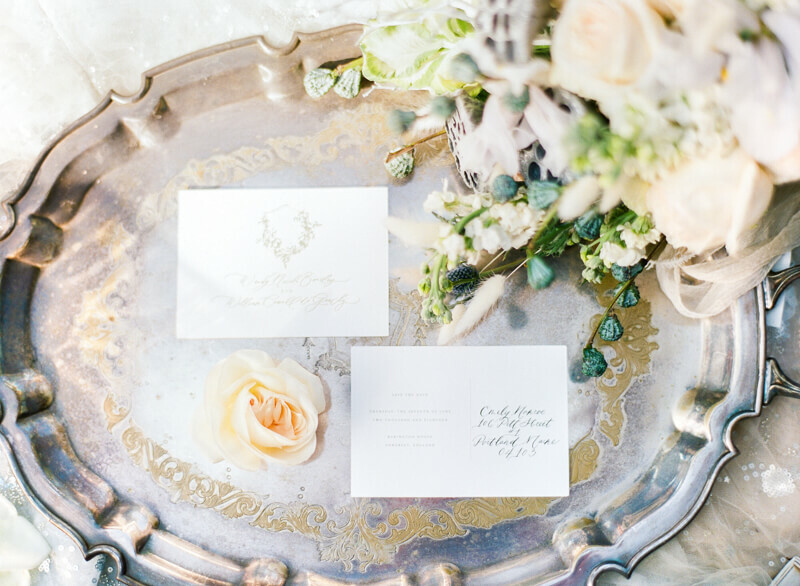 This is what styled shoots are all about – taking classic wedding themes and infusing them with imaginative ideas. From the stardust-inspired gown to the earthy accents and location, this styled inspiration has us looking towards the heavens in awe.